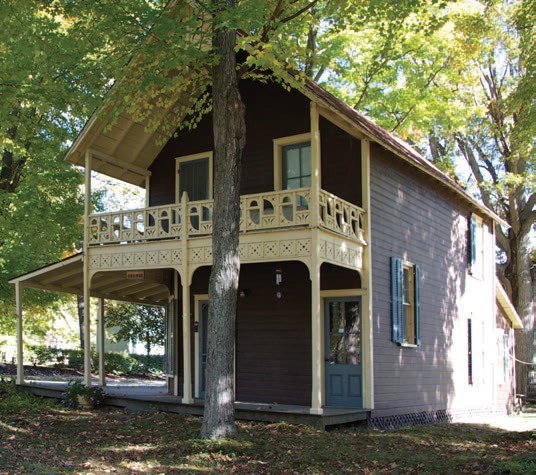 To access the full Preservation Handbook with further detail about each cottage style and more information, please click on the button to the left. As Thousand Island Park was founded as a Methodist Camp Meeting Association, its earliest structures were tents, often set up on platforms. These eventually evolved into simple wooden structures built upon the original platforms and some of these still exist in the Park. 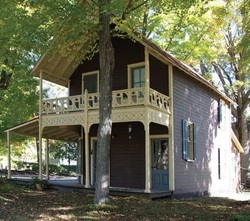 These Early Campground cottages combined wood and canvas (e.g. wooden front facade, canvas sides); eventually windows, doors and sometimes porches were added. Construction often used scrap material from packing crates. 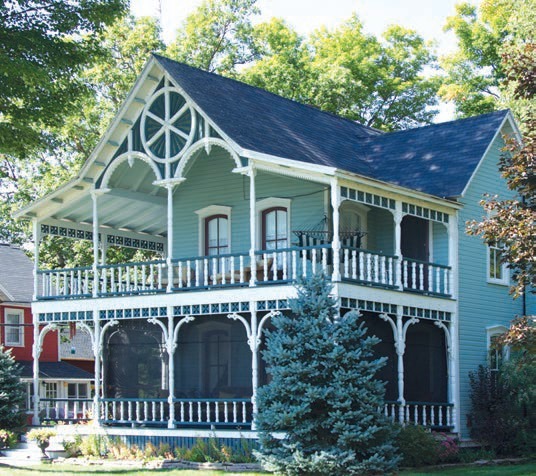 The earliest cottages had steeply-pitched roof gables and were upright in stature with decorative elements on vergeboards, gable trim and porch railings. The Eastlake style was named for Charles Lock Eastlake (1833-1906), an English furniture designer known for his use of elaborate ornamentation, and is the most prevalent style of the Later Campground design found in Thousand Island Park. Not that different in structure from the earlier Campground Style, these cottages are more decorative on their exterior. 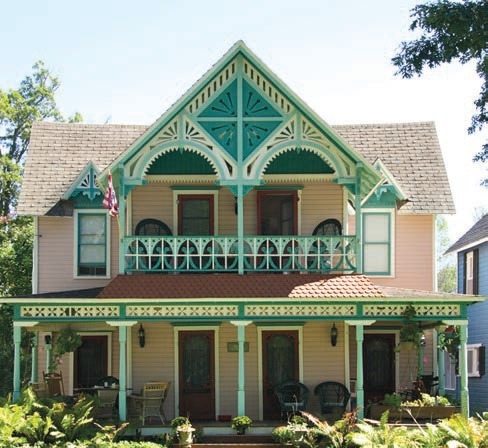 The term “gingerbread” is often used to describe the detailing on gables and porches. These Later Campground/Eastlake cottages were asymmetrical and vertical, being defined by steeply gabled roofs, cross-gables and large porches and verandas. Queen Anne Style demonstrates a move from a more vertical style to a horizontal, volumetric composition as the architectural style of the day moved toward elegance and grandeur. 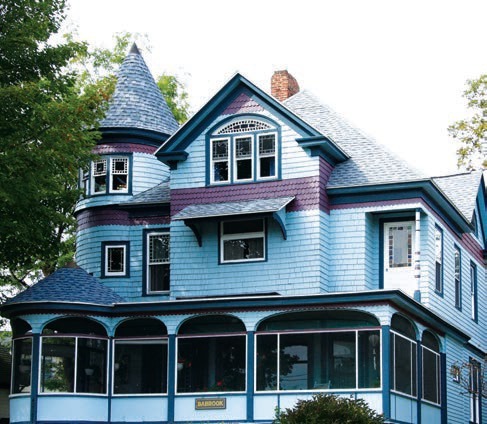 This style has the irregular massing of the Shingle Style combined with architectural elements such as towers, turrets, and encircling verandas. Many of the Queen Anne and Shingle cottages in the Park are hybrids showing elements of both styles. 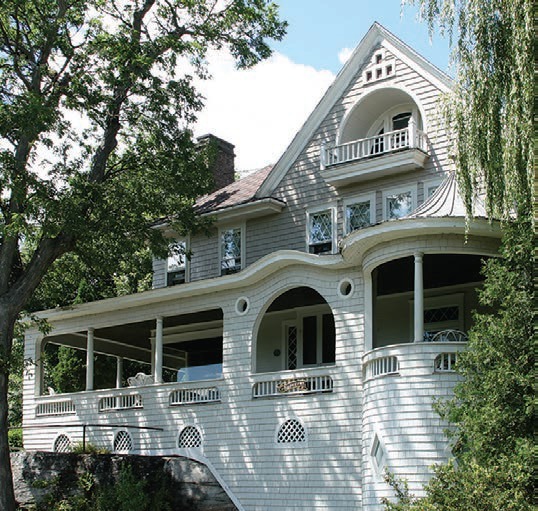 The asymmetrical façade with the front porch covering the first story is a classic feature of this style. 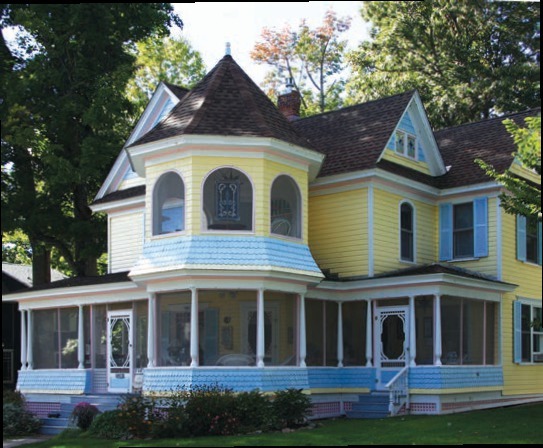 The cottage often will have a variety of sidings (horizontal, fish scale or diagonal pattern shingles and carved wood panels, board and batten) and rectangular windows often bordered with small square colored lights and/or stained glass transoms. 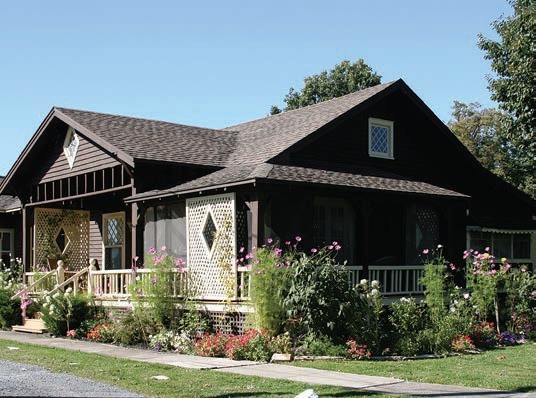 The Shingle Style cottages in the Park represent a change from Later Campground and Queen Anne designs to a bolder simplicity with irregular massing of rectangular and/or rounded forms. Renewing an interest in Colonial American architecture with a British influence, the Shingle Style cottage is typified by the uniform covering of wood shingles from roof to foundation. Accented with plain colonial and classical detailing, these cottages provide a sense of continuous volume and monumental solidity. Usually two or even three stories in height, this style is a uniquely American form of proto-modern architectural expression. 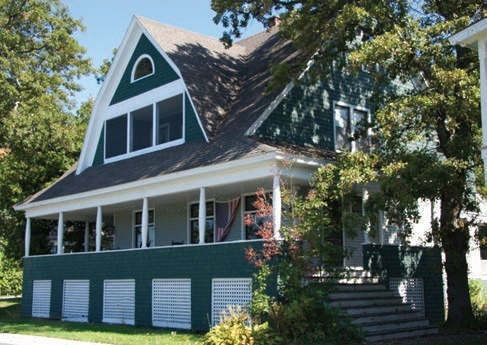 After the 1912 fire that destroyed much of Thousand Island Park, cottage owners turned toward the more simple and affordable design of the day – the “Arts and Crafts” style. 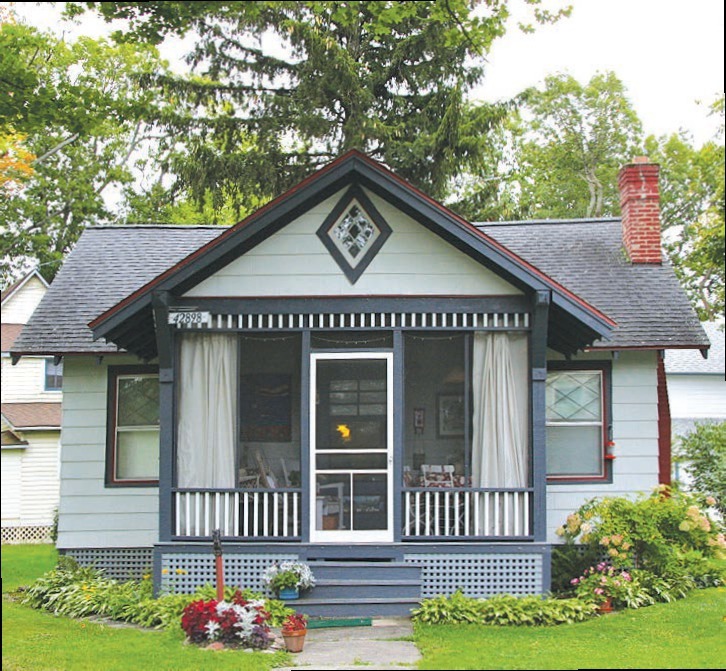 Craftsman/Bungalow was more basic and less grand than its predecessors and it combined simplicity of form with economical use of local natural material. Its emphasis on handicrafts and originality made it the latest trend in home design. The bungalow cottage is typically one, one and one/half or two stories with gently pitched broad gables. Second story dormers are often present. 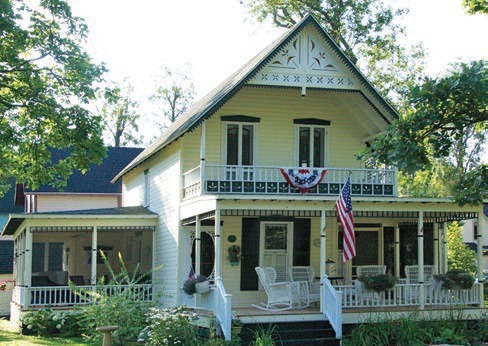 With a horizontal emphasis, these cottages often have porches under the main roof.